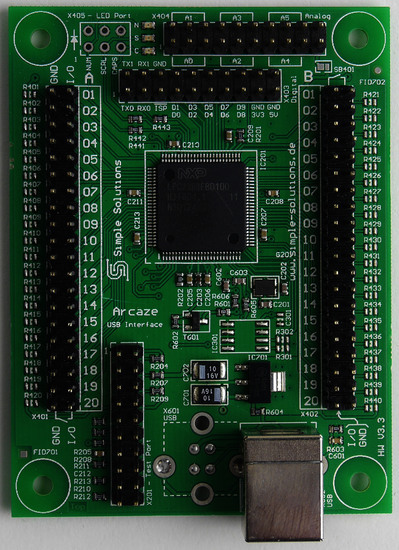 The Arcaze-USB Interface V3 conduces to the connection of pushbuttons, switches and incremental encoders to PCs through a USB port. Please follow these few steps after unwrapping your new module for the first time. Download the Arcaze USB Config Tool Setup . Execute it on your PC. You will be lead through all steps of the installation. If there is no Microsoft .Net (Version 2 or higher) installied on your PC yet, then the installer will download an install it automatically. 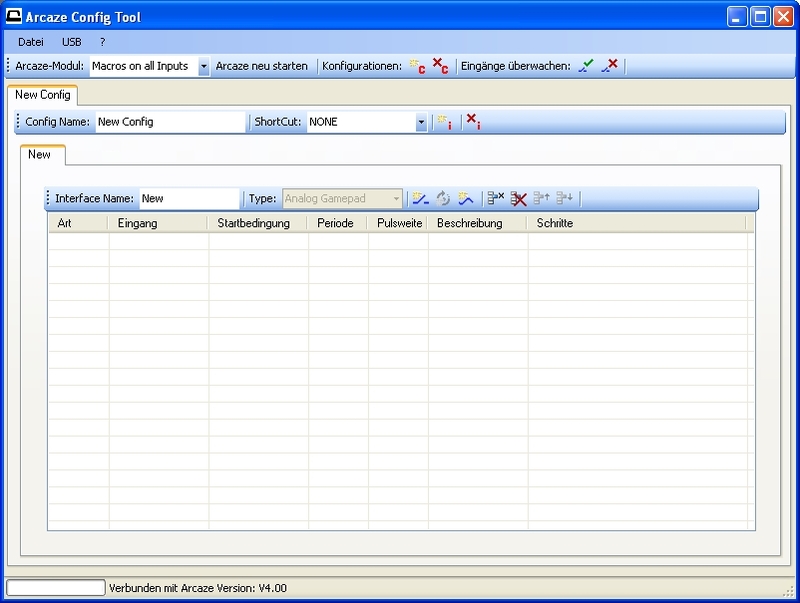 After the installation you will find new entries in the start menu for the Arcaze-USB Config Tool. It does also include the firmware updater now. A version of the Config Tool does always belong to a distinctive version of the firmware. There are constant improvements, new features and bug fixes on both ends, so it’s very likely that the preprogrammed firmware inside your module is not up to date anymore (and therefore not compatible with the most recent Config Tool). So you’re well advised to do a firmware update as the very first step. 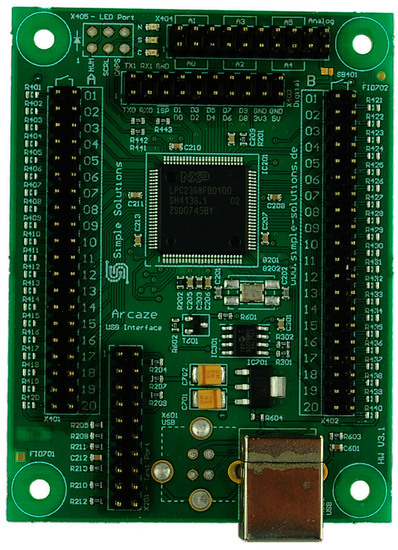 Connect your Arcaze module to a free USB port and wait until Windows recognized it completely. For the firmware update you should only connect one Arcaze to the PC to avoid confusions. Afterwards any number of modules can be connected simultaneously. The connected interface is seached and set to bootloader mode, during which the on of the LEDs on the module is blinking. After a few seconds click „Start Update“ again. The update will be performed in ca. 5 seconds during which the LED blinks irregularly. Done! Now you have the latest firmware on your module! Click „close“ to end the firmware updater. Now you can execute the Arcaze Config Tool to create a first simple configuration for your module. Click on „Arcaze-USB Config Tool“ on your Desktop or in the start menu (Start->Arcaze USB Interface) . Achtung! If you’re still using a 3.x config tool, then do not connect more than one module at a time during configuration. Starting from V4.x you can simply select the desired module from a dropdown menu. On the virtal Keyboard click an „A“ for example. This will be the key which we want to assign to one of the interface ports now. These functions (keys on the keyboard) are always called „Makro“ in the Config Tool, because it is also possible to trigger sending a complete „macro“ of multiple keys in row. Close a port of an arbitrary input, for example by pressing a connected pushbutton Tasters or by shorting with a paper clip. The associated „Input“ value will be displayed and selected automatically, whenever you press a connected button. This port will be assigned to the „A“ now. After programming any pressing of the connected pushbutton will send an „A“ to the PC. Starten text editor or for example MS Word. Whenever you press one of the buttons configures before, the desired ‚A’s will appear in the editor. Select the desired Arcaze module in the „Arcaze Module“ Dropdown box. Select „USB->Write Configuration“ in the menu. The new configuration is being written into the module. It is non-volatile. Close the config tool. The new configuration is available immediately. The configuration is now programmed into the interface and can be used. If you altered the device types compared to the previous configuration (number of interfaces, gamepad instead of keyboard, etc. ), then Windows will need a few seconds for the enumeration. If only port assignments have been changed, the device is available nearly instantly. The complete configuration of the module is now being displayed. Pushbuttons, Switches and incremental encoders are connected here. Each button/switch is connected to a pair of 2 neighbouring pins. These pairs are numbered and labeled A01 to A20. You’ll recognize these numbers in the Arcaze Config Tool. The pinout of this connector has been changed in PCB V3.2. For reasons please see PCB revision description below. The original pinout of Button connector A was the same as on the Button Port B.
Pushbuttons, Switches and incremental encoders are connected here. Each button/switch is connected to a pair of 2 neighbouring pins. These pairs are numbered and labeled B01 to B20. You’ll recognize these numbers in the Arcaze Config Tool. 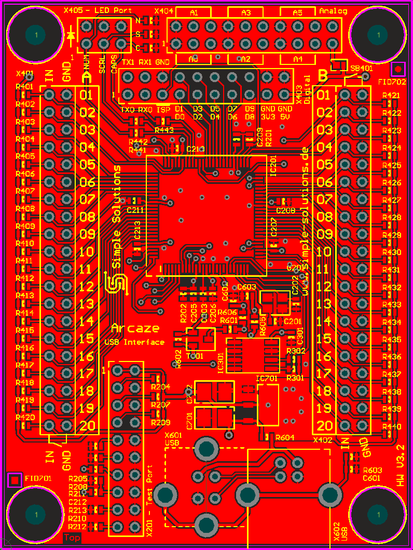 This pinout was used up to board revision V3.6 because it looked more intuitive for the user. However, it has the disadvantage that on a connected flat ribbon cable neighbouring signals are nested with each other, which can reduce signal integrity and prohibits simple mechanical splitting of such a flat cable into channels. 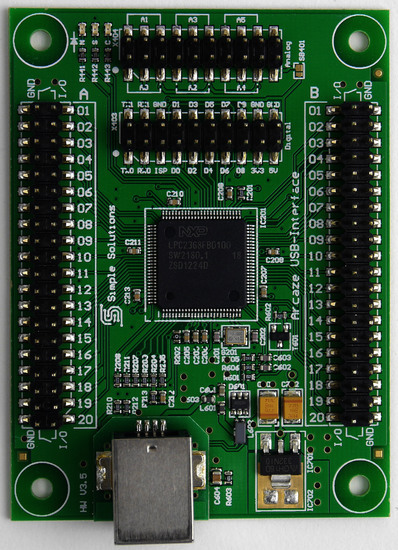 Therefore it has been changed with PCB V3.7. Only linear (not logarithmic!) potentiometers should be used. Allowable resistance is 1kOhms to 5kOhms. 10kOhms are still acceptable, but behaviour becomes increasingly with higher impedance. ~5kOhms is the best compromise and therefore the recommended value. Due to this new pinout, associated signals are routed together on connected flat ribbon cables. This improves noise immunity and enables splitting a flat cable into channels. Therefore there is still the recommendation to use resistances of 1kOhms to 100kOhms, even other values will work as well now. The 3 LEDs simply display the status of the 3 keyboard LEDs NUM-LOCK, CAPS-LOCK and SCROLL-LOCK. When in bootloader mode, the Num Lock LED is blinking quickly. There has never been a real use for the 2 of the 3 LEDs. 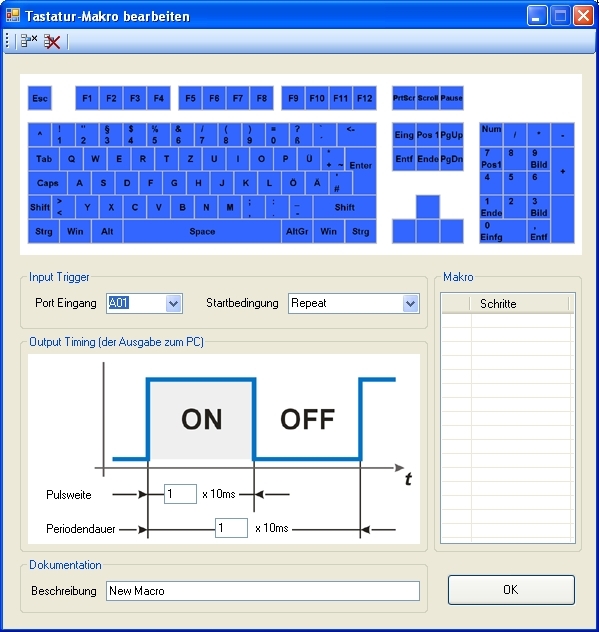 Therefore Caps Lock and Scroll Lock LEDs have been removed with hardware revision V3.6. Num Lock LED is still there. However, it is planned to reuse this LED as a generic Status-LED instead of Scroll Lock, because this created misunderstandings for some users. 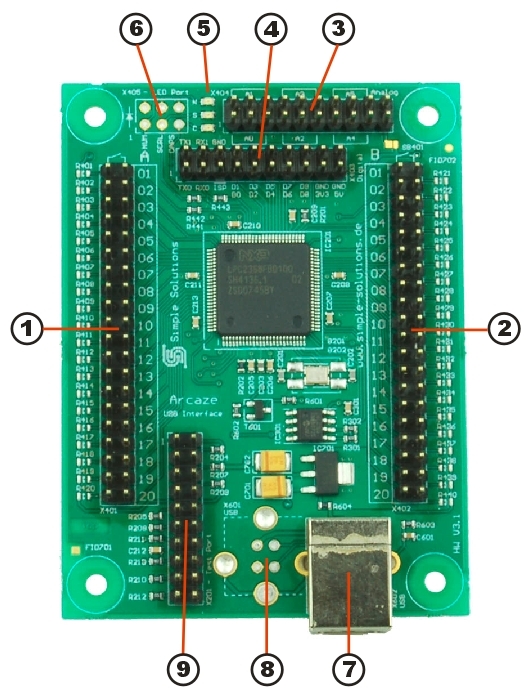 Up to board revision V3.3, there was an optional LED header for the 3 onboard LEDs. There were plans to use those LEDs for something. This never happened due to uselessness. Therefore the connector option was removed in hardware revision 3.4.
up to board revision 3.4, an alternative vertical USB port could be assembled for different mounting options. However nobody ever required this. Therefore this option was removed in PCB revision 3.5. 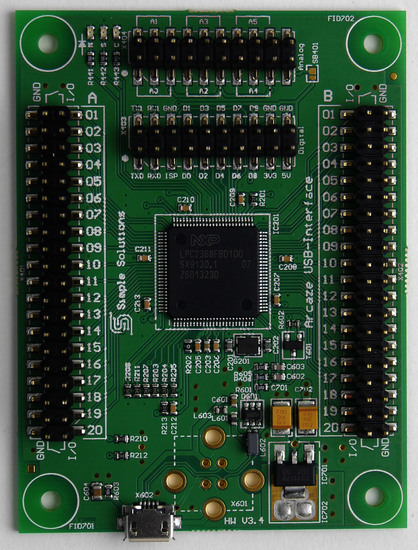 This connector was only assembled in early versions of the board and is only relevant for manufacturing. There is no other use of this connector. Up to 40 pushbuttons or switches can be connected to an Arcaze USB-Interface. 20 to each of the Button Ports. Each button or switch is connected to on of the numbered pin pairs of the Button Port. Polarity is not relevant when using buttons or switches without additional connections to external voltages. Up to 20 incremental encoders can be connected per Arcaze USB-Interface, 10 to each of the Button ports. 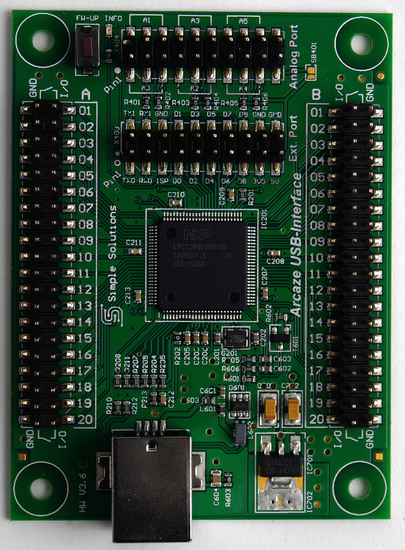 The 2 signal pins have to be connected to 2 neighbouring signal pins on the Button Port of the Arcaze USB-Interface, for example the signal pins of ports B01 and B02. Der common GND pin can be to either of the according GND pins on the same connector. The second according GND pin can be left open. The polarity of A and B sets rotation direction. When the 2 pins are swapped, rotation direction is inverted. As soon as the Arcaze USB-Interface is configured, it’s just a collection of keyboards and/or gamepads. Therefore it’s compatible with all operating systems supporting USB Keyboards and gamepads in a composite USB device. This includes all currently available Windows version starting from Windows 98, as well as all Linux systems of the past 10 years. To just operate a configured module as a HID, no special software installation is required of the host, it just has to support the mentioned USB keyboards / gamepads in a composite device. Windows PC with Windows XP, Vista oder 7 (32 or 64 Bit). Currently there is no ConfigTool for Linux or Mac. The module itseld however can be used on these machines as well. 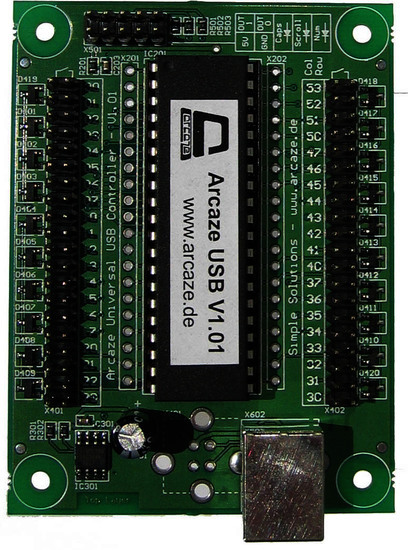 The very first version of the Arcaze USB-Interface was sold in 2005, was still part of the Arcaze Retro Console and was based on a different architecture. Therefore it is not compatible with the current firmware. Version 2 has never been published. Starting from version 3.0 all modules are compatible with the current firmware. There is no photo of V3.0, but there are functional differences compared to V3.1. V3.2 shows the pinout of the Button Ports, which is valid for versions 3.0 through 3.2: Left column of each button port is I/O pins, right column is according GND. In version 3.3 there was an important change: In the previous versions the pinout of Button Ports A and B (the 40 pin headers) was laid out identically as described in the previous chapter: Left column of each button port is I/O pins, right column is according GNDs. 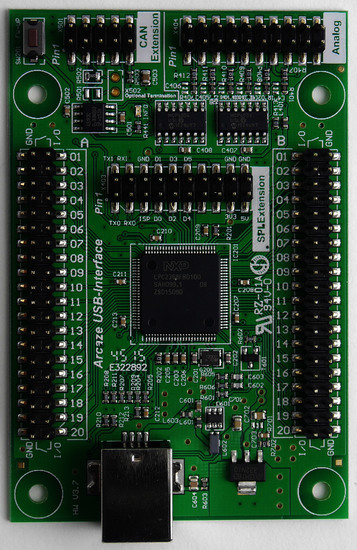 With the appearance of the first Power Driver and Breakout Extension boards, this proved to be more unintuitive than a symmetrical layout which would allow for symmetrical cable routing. Therfore the columns of Button Port A were swapped, to have GND on the outer column of each Button Port and the I/O pin on the inner column of each button port. We’re aware that it would have been nicer to also mirror the pin numbers. But this would have lead to incompatible firmwares for the hardware versions, which we wanted to avoid. It’s likely that this step can be completed in a later version of the hardware. In version 3.4 we tried to introduce Micro USB, because that had worked well in other products. However there were many delaminated connectors in the field (presumably because there is no housing around the PCB). Therefore, this approach was given up again in the next revision. LEDs 2 and 3 were removed due to uselessness. (they had displayed Caps Lock and Scroll Lock). Instead a pushputton was added, which allows to start the bootloader without the jumper trick. To do this, the pushbutton has to be depressed when attaching the module to USB. The analog ports received small pulldown resistors to avoid wild floating of unused analog inputs in the Config Tool. The new CAN based extension modules are soon arriving, therefore a 10 pin CAN Extension Port has been added. The old 20pin Extension Port has been renamed „SPI Extension“, but stays in place. The Analog Port received amplifiers, to allow connection high resistance potentiometers without creating unlinearities. Analog Port pinout was changed! Refer to Analog Connector description! The modul length had to be increased by 1cm. Dimensions are 90x60mm instead of 80x60mm now. The mounting holes stay in the same positions as before.